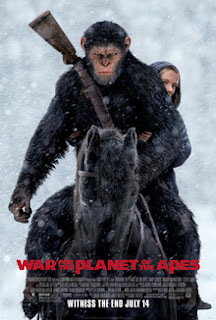 The new line of Planet of the Apes movies is most obviously the prequel story line to the 1968 movie Planet of the Apes. I would suspect that whenever they are done making this set of movies, you could play all of the prequels in order and then play the 1968 movie and it would all line up. One of the things I like about these prequels is that I am starting to see bits and pieces of the 1968 movie falling into place. For example, this newest movie explains why some humans in the 1968 movie cannot talk. While most of the movies that followed the 1968 film are poorly written, the 1968 movie is often considered a masterpiece. Another thing I like about the new movies is that they continue that tradition of excellent screen writing and character development. The very first thing I did after I finished watching War for the Planet of the Apes was look up how many religious and parental groups were protesting and cursing the movie. Why would I look for that? Because this is the first movie I have ever seen with a Moses allegory and a Jesus allegory in the same movie, and in the same character. I really thought the religious whackos would be out in full force, but it seems like they prefer to pick on children's movies such as Harry Potter or Narnia. When the adults make these references, I guess it is okay. This is an excellent movie with tremendous special effects and a very well-written story. There are some parts of the story that kind of dissolve without resolution, but they are not significant enough to ruin the flow of the movie itself. The character of Caesar has been carefully developed over the first two movies, and now it stands as one of the most interesting characters in movies today. Director Matt Reeves directed Dawn of the Planet of the Apes as well as Cloverfield, so he is no stranger to fast-paced action movies. Reeves is a director on the rise, and DC is counting on Reeves to help re-establish one of its iconic characters when he directs the forthcoming Justice League movie, The Batman. There are a couple of curiosities about this movie that leave me wishing Reeves had put more thought into them. Caesar is one of only a handful of apes who can talk, but yet all of the apes have no problems communicating. I guess that would not be so bad except for the fact that more than once throughout the movie, apes such as Maurice would make a couple of signs that translated, somehow, into complete sentences. There are even times when an ape would nudge Caesar and Caesar would know exactly what the ape was saying, even though Caesar was not even looking at the ape. I also had a problem with an army base filled with army guys that had the absolute worst security I have ever seen. I understand that certain scenes that happen inside that base are critical to the story, but some of the security miscues were almost embarrassing to watch. It really was not a surprise when the guys securing that base ran into trouble later in the movie when they had to fight a larger and better-equipped force. But those small indiscretions are swept away with how well this movie is written, directed, and performed. Woody Harrelson delivers one of his typical "badass bad guy" performances, but this script gives his character such depth that Harrelson is finally able to show just what kind of "badass bad guy" range he has. Harrelson completely dominated the film with his performance, but his was only one in a long list of great performances in this film. The visuals in this movie are amazing, the emotion created by the performances is real, and the story is compelling. You cannot ask for much more than that from a summer blockbuster, much less one part of an extremely entertaining franchise. If you are a child of the 70s, as I was, and loved the old Planet of the Apes movies, then there is plenty in this movie for you. If getting upset about religious symbolism is your thing, then you will love to hate this movie in your own special way. If you have Dawn of the Planet of the Apes on disc, then I would recommend watching it before going to see this movie. It will help you fill in some story holes that I had a hard time remembering. But aside from that, this is an excellent drive-in movie and something that action movie lovers will truly enjoy. George N Root III is a movie fanatic who loves it when new movies tie into old ones instead of ripping old movies off. Follow him on Twitter @georgenroot3, or send him a message at georgenroot3@gmail.com.